Go to page 48 of issue 2 here. 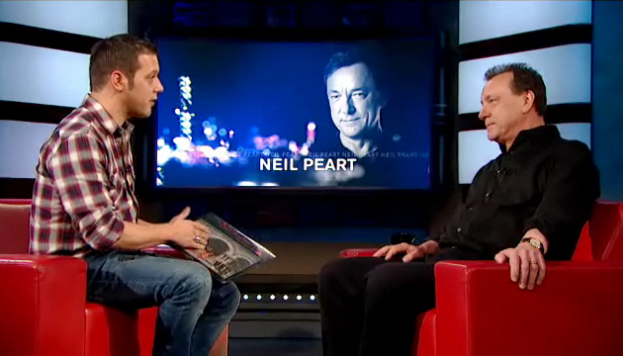 You can watch Neil's full interview with George Stroumboulopoulos here. I was at this show and was amazed at the intensity and energy of the band. 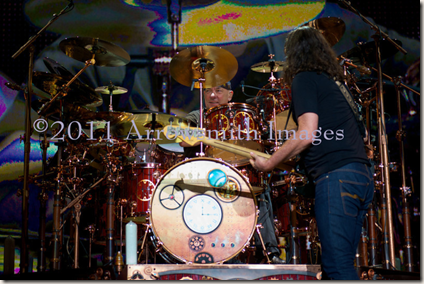 Update: 6/10/11 - 8:00 p.m. - Adding HD version of video and screenshot from opening of show. 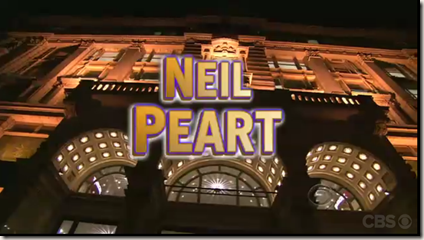 Update 6/10/11: Here's the full David Letterman episode. 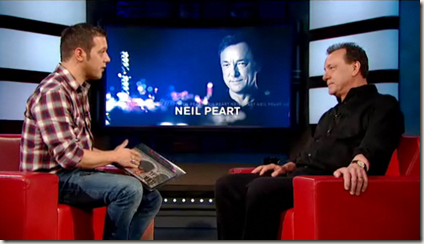 Tune in to see Neil Peart on David Letterman tonight, Thursday, June 9, at 11:30 p.m.
An excerpt of Ari Gold's interview with Neil Peart is now available on YouTube. The full interview, which was recorded at Drum Channel, eventually ended up as an Extra on the Adventures of Power US DVD release. If you haven't seen Adventures of Power yet, check it out! 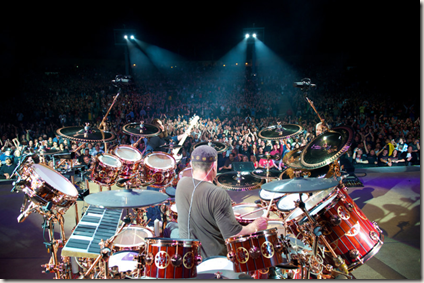 Not only is it a great movie, but it has a nice Neil Peart cameo. In a previous story, "The Power of Magical Thinking," I concluded with a photograph of the audience I had taken from the stage in Santiago, Chile -- the first time in my life I had ever done that, and a memorable occasion to capture that way. 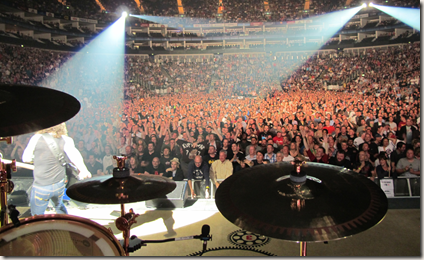 I decided to do the same in London, as another memorable occasion, for all of the reasons outlined above. 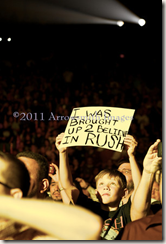 On my way back up the steps and across the stage to the drums for the encore, I had Lorne hand me my camera, and while Alex and Geddy were tossing out T-shirts to the crowd, I snapped this photograph. 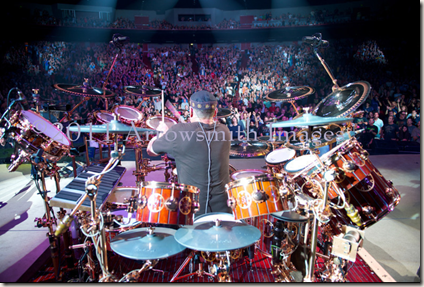 Like the photo of the Santiago audience, this one tells many stories. 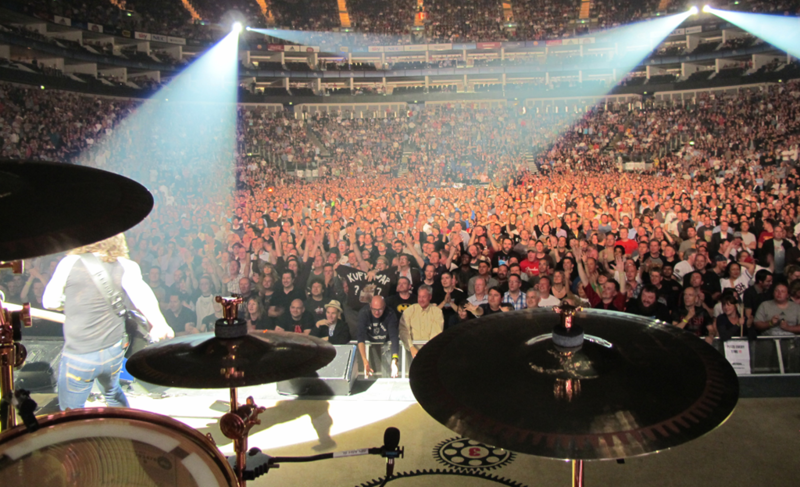 First of all, it's of me and my bandmates headlining in front of 13,517 people in London, England -- exactly forty years since I arrived there as an ambitious teenager. 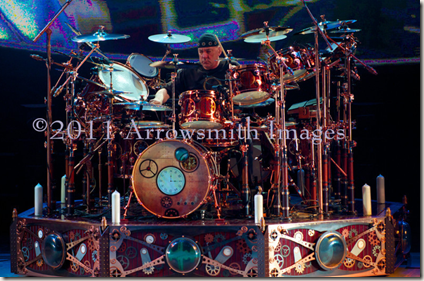 MusicRadar.com caught up with Neil Peart to talk about this David Letterman solo, as well as drum solos in general. 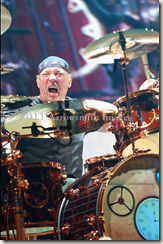 Just back from a morning rehearsal, Peart admits that when he was approached to be part of Drum Solos Week, his initial reaction was, "I don't know�it's not really my thing. 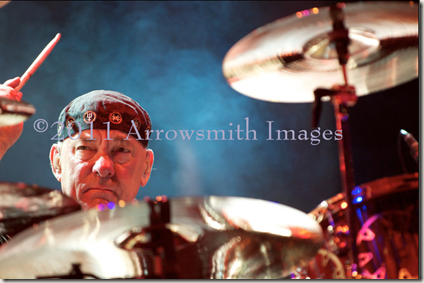 But then I thought, Hey, a drum solo on TV - sounds great! 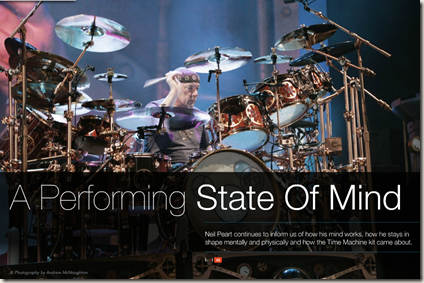 I'd be very honored to be the ambassador to drum solos." 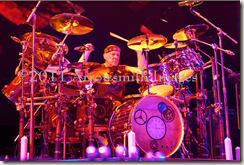 According to tweets from both Brutus, Neil Peart's friend and riding partner, and Lorne Wheaton, Neil's drum tech, Neil is taping the drum solo today (Monday) to be broadcast on David Letterman's Thursday, June 9 show. If you attend the show, let us know what you thought. 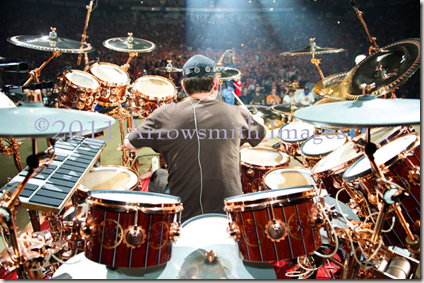 On May 25, 2011, Rhythm ventured to London to interview The Professor, Rush's Neil Peart, for a forthcoming issue of the magazine. In addition to the interview we also headed to the stage of the O2 Arena for an exclusive tour of Neil's phenomenal Time Machine kit with his long-time tech Lorne Wheaton. 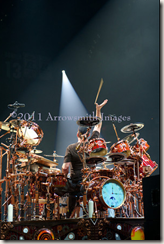 Join us on stage for a AAA look at one of the greatest drum set-ups on the planet! Our thanks to Lorne for the tour and to Chris from Sabian for helping us set this up. Thanks to Rushisband.com for the head's up! Band geeks unite: Late Show with David Letterman is kicking off its first ever "Drum Solo Week." The late-night staple is dedicating a week's worth of episodes to performances by some of the music industry's top percussionists, starting with a standout solo on Monday, June 6 from the Late Show's very own Anton Fig, the drummer in Paul Shaffer's band. 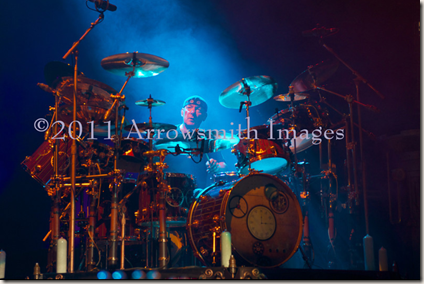 The following night, Letterman welcomes Sheila E. and her world renowned skill with the sticks. On Wednesday, June 8, drum legend Roy Haynes takes the stage, boasting a career filled with Miles Davis and Sarah Vaughn collaborations (to name a few). 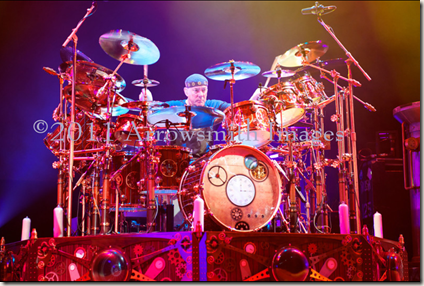 And rounding out the week is a performance by Rush's Neil Peart, a drummer who is often regarded as one of rock music's greatest. 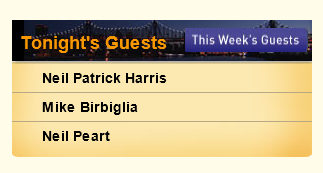 The Late Show's "Drum Solo Week" debuts Monday, June 6 at 11:35/10:35c on CBS. 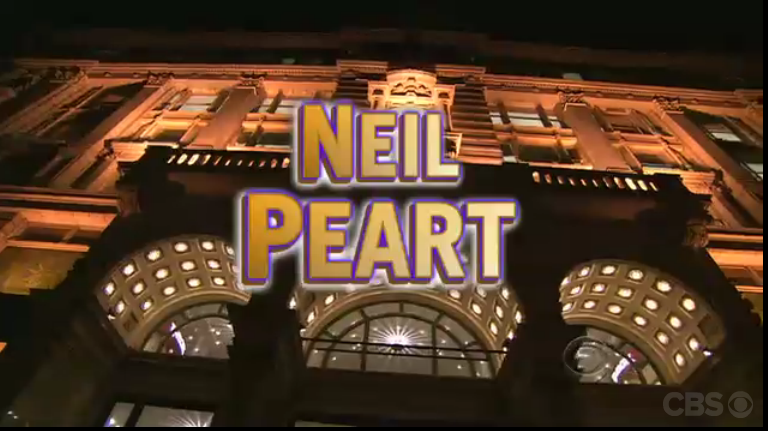 Still no word about whether Neil will be live on the show or pre-taped. Thanks to PowerWindows.com and Rushisaband for the head's up.